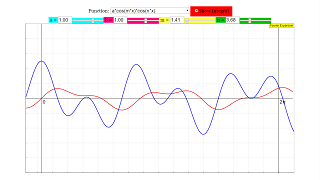 The Fourier Series is a series that decomposes any periodic curves into a sum of sines and cosines. In this simulation, you are instead given several functions with multiple parameters a, b, m, n to select from and you can adjust them with either the sliders or the fields provided. The appearance of the periodic wave will change accordingly. There is also a red checkbox labeled "Show Integral" that when checked, does exactly what it says. The integral is shown in red, and the value of the integral curve at a point denotes the net area under the curve from 0 to that point. Do play around with the parameters and see how it affects the curve.